Trump spoke at the El Paso County Coliseum, which was draped with banners reading „finish the wall“ — an apparent update to his „build the wall“ campaign slogan. 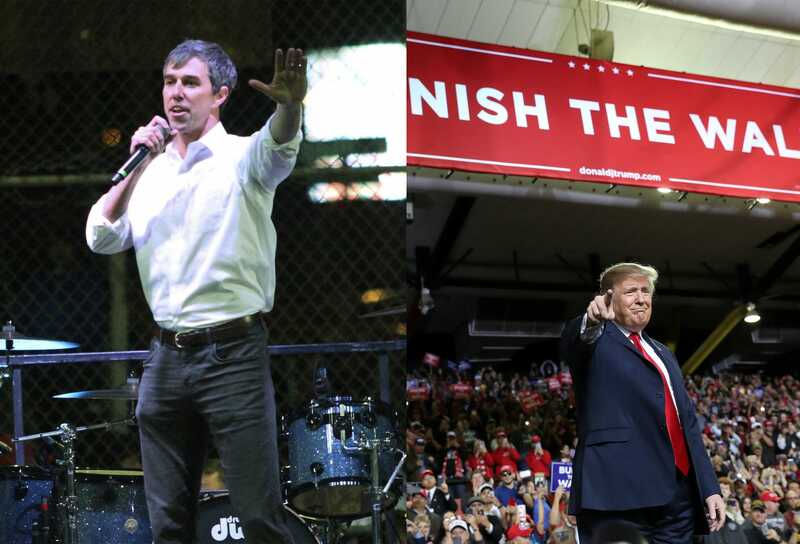 O’Rourke spoke at a pro-immigrant, anti-Trump march organized by activists, which ended at a baseball field a mile away from Trump’s rally. „We’ve actually started a big, big portion of the wall today at a very important location, and it’s going to go up pretty quickly over the next nine months,“ Trump said. The AP points out, however, that this portion is only 14 miles long and funded by Congress last year. For context, the border is roughly 1,933 miles long — 1,279 miles of the border does not have a fence. „He has 200 people, 300 people, not too good,“ Trump claimed. This number was off, according to the Associated Press, which didn’t have an exact number but put O’Rourke’s crowd in the thousands. The Associated Press reports that the bill contains „$1.375 billion to build 55 miles“ of a border barrier made of steel slats. This figure is much less than the $5.7 billion that Trump was demanding, so it’s unclear if he’ll take this deal.